This is an easy dish to make, using a whole cut up chicken or selected pieces. The recipe calls for chicken, carrots, capers, white wine, rosemary, kalamata olives, salt, and olive oil. Serve over rice for a great meal. Rinse and clean chicken thoroughly to remove any debris, feathers, etc., pat dry. Add olive oil to a large deep skillet and bring to high heat. Sauté the chicken with the rosemary until the chicken is well browned, about 10 minutes. Turn the chicken skin side down, and douse (deglaze) with wine. Sprinkle with salt. Add carrots, capers, and olives. Reduce heat to low, cover, and simmer for 1 hour 30 minutes. If it needs more liquid, add the water. 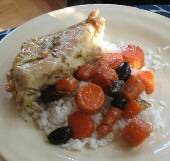 Tip: As it cooks, liquid from the chicken, carrots, and olives will increase liquid in the pan. It should not need water.